5 Major Instructions Contact Lens Wearers Don’t Follow! Do you wear contact lens? If yes, then there must have been times when you had forgotten to follow the instructions given by doctor regarding wearing contact lenses. Usually, people take this medical device granted or forget to follow the daily routine and as a result they experience a lot of eye issues. Washing hands before touching the contact lenses is a basic instruction, which helps to keep lenses clean and eyes healthy. Think about the germs shift from door handles, countertops or keyboards to your hands and then to your contact lens. Germs can cause severe problems to your eyes, like malicious infections, which may harm your sight. So, before you touch your contact lens, go and wash your hands first! Once you take out the contact lens, before you put it in the super fresh, filled to the brim solution, rub it for five seconds between your fingers to remove deposits that have stuck to the lens. Have you ever kept your contact lens in old liquid solution? Don’t worry, you are not alone, who has committed this offense. As per the study, 96% contact lens wearer admitted that they have reused or topped of the old solution. When a contact lens sits and soaks in solution, the liquid becomes depleted of its organism-killing biocide, renders it vain for disinfecting your lenses. Clean your lens everyday with new solution, don’t use old solution. After every use, rinse the case with contact solution and wipe it out with clean towel. Then keep the case with its caps open. Anything that can live in your eye won’t live in a dry contact lens case. 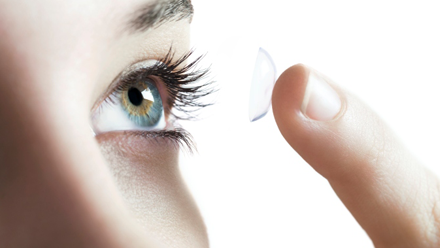 Even though, contact lenses are prescribed medical devices, participants should not wear it for a longer duration. 84% of the participants wear their contact lenses for longer than suggested time period. Whether, it is every or after 10 wears, change your contacts as often as your doctor suggests to avoid infection and eyes irritation. This entry was posted in Contact Lenses and tagged Contact Lenses, Contact Lenses Tips, How To Clean Contact Lens?, How To Take Care Of Contact Lenses? on January 13, 2015 by shreekrishnanetralaya. Opt For Lasik To Ditch Glasses!